"We will not be driven by fear into an age of unreason" | Jon Katz, P.C. 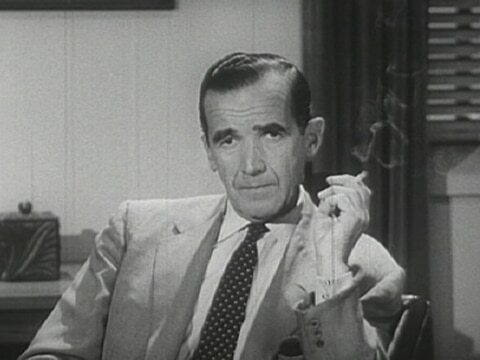 Edwward R. Murrow (From the public domain). Edward R. Murrow took on Senator Joseph McCarthy. In many respects, McCarthy was just a prelude to today’s Constitution-shredding in the name of fighting terror. In standing up to Mr. McCarthy, Mr. Murrow said: "We must not confuse dissent with disloyalty. We must remember always that accusation is not proof and that conviction depends upon evidence and due process of law. We will not walk in fear, one of another. We will not be driven by fear into an age of unreason, if we dig deep in our history and our doctrine, and remember that we are not descended from fearful men — not from men who feared to write, to speak, to associate and to defend causes that were, for the moment, unpopular. "This is no time for men who oppose Senator McCarthy’s methods to keep silent, or for those who approve. We can deny our heritage and our history, but we cannot escape responsibility for the result. There is no way for a citizen of a republic to abdicate his responsibilities. As a nation we have come into our full inheritance at a tender age. We proclaim ourselves, as indeed we are, the defenders of freedom, wherever it continues to exist in the world, but we cannot defend freedom abroad by deserting it at home. "The actions of the junior Senator from Wisconsin have caused alarm and dismay amongst our allies abroad, and given considerable comfort to our enemies. And whose fault is that? Not really his. He didn’t create this situation of fear; he merely exploited it — and rather successfully. Cassius was right. ‘The fault, dear Brutus, is not in our stars, but in ourselves.’"
Good night, and good luck. Jon Katz. ADDENDUM: After writing this blog entry, I saw the online movie trailer to Good Night and Good Luck — which I wanted to see when it first came out, but did not — and saw that it prominently features the above quote.